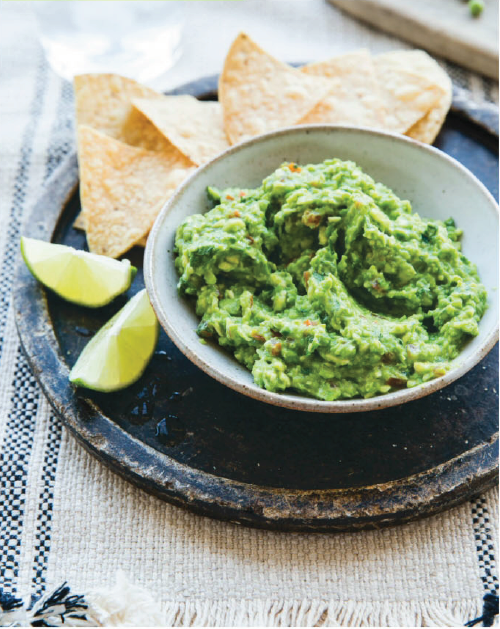 Cut the avocados in half, remove the pits and scoop the flesh out with a spoon into the bowl of a food processor. Add the peas and pulse until a chunky mixture forms. Transfer the avocado pea mixture to a large bowl. Stir in the tomato, red onion, jalapeños or mild chillies, lime juice and coriander and salt to taste. Using a wooden spoon, stir the ingredients to combine. Serve immediately with chips or sliced veggies. 155 calories, 10g fat (1g saturated), 15g carbohydrates, 7g fibre, 4g protein. End.